For Veterinary Technology students at Douglas College, an important part of their program involves learning how to provide the kind of hands-on care that keeps pet cats purring happily. Thanks to a new clinical research project, students in the program will also get to help advance scientific understanding around a major feline health issue. 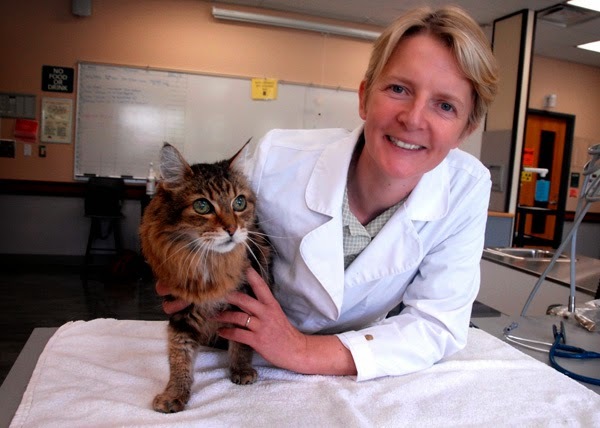 The three-year study, led by instructor Jennifer Wakeling, will look into the veterinary care and health of cats that have been treated for hyperthyroidism, a common disease of the neck glands. The study will involve collecting data on over 100 cats and research will take place at the Douglas College Coquitlam Campus and local veterinary clinics. Over the course of the project, as many as 18 Veterinary Technology students will take part as research assistants, or through practicum or co-operative education placements. The study will focus exclusively on pet cats in the Lower Mainland that have been treated for hyperthyroidism using radioactive iodine, a treatment often recommend by veterinarians. The study will evaluate the reliability of various tests used to assess the health of cats after they have received such treatment and track longer-term health outcomes. “This research will provide data that will help optimize the diagnosis and treatment of common healthcare problems in any cat that has been treated for hyperthyroidism, irrespective of treatment type," says Wakeling, a practicing veterinarian. "My ultimate goal is to help veterinarians and owners work together to provide the best possible quality of life for their senior pets." To conduct the study, Wakeling has received a $67,000 grant from the Natural Sciences and Engineering Research Council of Canada through its College and Community Innovation Program. Also providing support are IDEXX Laboratories Canada Inc., which will provide complimentary laboratory testing, and by North West Nuclear Medicine for Animals, a Vancouver veterinary facility dedicated to treating hyperthyroid cats. Learn more about the Veterinary Technology program on the Douglas College website.